Delia Akeley is probably best remembered as a "wife-of," having spent two decades married to famed taxidermist and conservationist Carl Akeley. 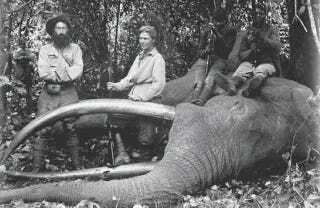 But Delia was a fascinating adventurer in her own right, an early primatologist, anthropologist studying the pygmy peoples of Belgian Congo, and skilled museum-backed hunter—the woman who felled a record-breaking bull elephant for the American Museum of Natural History. Delia Akeley was born Delia Denning in 1875, the youngest of nine children growing up on a farm near Beaver Dam, Wisconsin. Throughout her life, Delia was primarily known as "Mickie" for her hot temper, which was associated with her Irish heritage, and even as a child she was a hellion, dumping dirt in the buckets of boys who were hauling water water from the community well and getting even with a crew of taunting brickyard workers by stomping over a day's worth of drying bricks, ruining the entire set. At age 13, she ran away from home and made her way to Milwaukee where she married Arthur Reiss, a barber, when she was likely just 14 years old. It was perhaps through Reiss that she met the man who would become her second husband and who would open the door to her scientific future, Carl Akeley. Carl Akeley is often called the father of modern taxidermy, a man whose carefully observed and rendered work still fills the halls of natural history museums. Early in his career, he worked for the naturalist and geologist Henry Ward, mounting exotic specimens that Ward collected from all over the world. But the most famous work of his pre-museum career was for showman PT Barnum, who commissioned Ward's Natural Science to mount Jumbo, the famed African Bush Elephant who had been exhibited in the London Zoo and then at Madison Square Garden as part of Barnum & Bailey Circus. Akeley and his mentor, William Critchley, stretched and mounted the deceased elephant's hide, so that Jumbo was larger in death than he ever had been in life. Eventually, though, Akeley was directed to work better suited to his naturalist inclinations, taking a gig with the Milwaukee Public Museum. Carl Akeley may have met Delia during a hunting trip with Arthur Reiss, and she quickly became smitten by the artistry of Akeley's work. Much taxidermy of the day was a far cry from the lifelike displays in modern halls of mammals, stuffed with straw or sawdust. Akeley's hides were mounted on sculpted forms, made to imitate the form and body language they had held in life. Even before they married in 1902, Delia became Carl's assistant, an invaluable aid at a time when he could not afford to hire labor. Carl Akeley believed that taxidermy animals should be displayed not just on their own, but in artificial habitats matching the animal's natural environment. Delia helped him create these environments, casting thousands of leaves in beeswax for his famous piece, "The Four Seasons," a diorama that presented deer in spring, summer, fall, and winter. The piece was sold to the Chicago Field Museum (Carl Akeley had long since separated from the Milwaukee Public Museum) and solidified Carl's prominence as a taxidermist. In 1896, the Chicago Field Museum funded its first African collecting expedition, sending staffers to hunt animals to bring back as specimens for the museum. Carl Akeley went on the trip—during which he famously killed an attacking leopard by shoving his fist in the leopard's mouth, choking it while strangling it with his free hand. Delia was jealous, but she would get to see the plains of Kenya first-hand when she accompanied Carl on the Field Museum's second collecting trip in 1905. In this day and age, this sort of hunting may seem at best an ironic and distasteful activity, but the Akeleys saw themselves as hunting not for sport (and, in fact, vocally condemned sport hunting), but in order to present a natural vision of Africa to the American people. Kenya, like many parts of Africa, was rapidly changing, thanks in large part to European colonialism and development. Carl and Delia felt that through their study and collecting of specimens, they were capturing a snapshot of a vanishing world. That's not to say that they didn't kill their share of wildlife. Carl Akeley admitted that in certain cases, where he didn't feel that the animal had a sporting chance of survival, "much of the shooting that I have had to do in order to obtain specimens for museum collections…has made me feel a great deal like a murderer." Scarcely breathing, and with legs trembling so I could hardly stand, I waited for the elephant to move forward. Dimly through the mist the dark shape came slowly from behind the bush, exposing a splendid pair of tusks and a great flapping ear which was my target. With nerves keyed to the point of action I fired, and the first elephant I shot at fell lifeless among the dew-wet ferns...He was a splendid elephant, standing ten feet ten inches tall at the shoulders and carrying 180 pounds of ivory. In his back was a great festering wound caused by a poisonous spear. The iron blade had worked its way into his flesh to his rib and he must have suffered agonies. Today, that very Mount Kenya elephant's stands mounted in the museum's Stanley Field Hall. Beside it is an elephant felled by Carl, who considered it an inferior specimen because it was missing one tusk. Nineteen of her other specimens from that expedition are still catalogued at the museum. The couple's next expedition was in 1909 to collect a family elephant group for the American Museum of Natural History. At one point during the trip, Carl and Delia were joined by a much more famous hunter, former US President Theodore Roosevelt, and his son Kermit, who ended up shooting an elephant for the group. But the trip is more notable for an incident in which Delia saved her husband's life. Despite suffering ill health during the expedition, Carl was obsessed with the idea of collecting a perfect cow, calf, and two bulls for his group, and on one occasion, that obsession proved nearly fatal. While Carl was off on a hunt Delia had remained at camp, managing the porters (Swahili and Kikuyu men and boys who did the difficult work of carrying gear, clearing jungle, and acting as guides; those who accompanied their white employers on hunts were not even permitted to shoot their guns unless said employer was in mortal danger). Two guides who had accompanied Carl returned to camp and announced that Carl had been attacked by a bull elephant and was lying injured in the jungle. Delia sent for medical help and prepared a rescue mission, ordering (not asking, she notes in her memoirs) twenty porters to accompany her, but she claimed that Wimbia Gikungu, a teenaged boy fiercely loyal to Carl (who referred to the boy as "Bill"), reported that the men were afraid to go into the jungle at night and would kill her if she went forward with the rescue mission. Panicked and afraid for her husband, she resorted to ridicule, mocking the porters as crying babies until they became amused and agreed to accompany her after all. The party found the trampled Carl, and Delia dressed his wounds and nursed him until a medical missionary arrived to help. Carl eventually recovered, and his Mickie provided another valuable bit of aid on his expedition: killing one of the elephants he would eventually use in his family group. While Carl's great African love was for elephants, Delia developed an intense fascination with primates during her expeditions to East Africa. She would carefully study and report on the behaviors of the monkeys she observed, and while she was not a trained ethologist and tended to anthropomorphize her subjects, some of her findings would be confirmed by later researchers. She was especially captivated by baboons, whose language she would attempt to imitate in an attempt to engage the animals—and she was quite nearly attacked by a baboon in the process. But when Delia fell head over heels, it was for a vervet she found along the Tana River during her second expedition to Kenya. One of the members of the expedition was John T. McCutcheon, a famous political cartoonist, and Delia named her monkey—who was, in fact, female—J.T., Jr. in his honor. Against Carl's better judgment, she decided to keep the monkey as a pet, bringing her home with them to Manhattan, where she had her own bedroom. Photo via Women of the Four Winds. Thus begins one of the stranger chapters in Delia Akeley's life. Upon their return to the US, the Akeleys enjoyed some celebrity and began moving in high social circles. But Delia was quite obsessed with her pet, who demanded more and more of her attention. She decided from the start that she would never discipline J.T., Jr. no matter what her sins against the Akeleys' property or physical well-being. The monkey shredded furnishings and clothes, played with the bathroom faucets, and even bit Delia's leg, which became so badly infected that later in life she had to walk with a cane. She became increasingly reluctant to leave J.T. 's side, to the point that she insisted on having the surgery on her aforementioned leg in her Central Park West apartment. J.T. 's presence may have been a contributing factor to Delia and Carl's emotional estrangement, though perhaps it was a symptom. However, Carl did separate his wife from her monkey in the end; after J.T., Jr. bit Delia's wrist, nearly severing the vein, Delia consented to Carl's proposition to have the monkey sent to a zoo in Washington, DC. While her adoption of the monkey was ill-advised, the book Delia subsequently penned, J.T. Junior: The Biography of an African Monkey, was an early intimate portrait of a primate, albeit one kept in captivity. She published it in 1928, two years after Carl's death, and dedicated the book to him, "To the memory of Carl Ethan Akeley whose life and work I shared for many years and who understood and love 'J.T., Jr.' as I did." But like her relationship with J.T., Jr., Delia's relationship with Carl did not last. After two decades with Carl, Delia left for France in 1918 to work with the American Expeditionary Forces, and later that year, Carl filed for divorce, claiming she had deserted him. They eventually divorced in 1923, after which Carl married his second wife, Mary Jobe Akeley. Carl died in 1926 on Mount Mikeno after a bout of fever. His new wife buried him, led the rest of the expedition, and later scrubbed Mickie from her late husband's biography. Delia's divorce from Carl was by no means the end of her exploration career, however. In 1924, she announced a new expedition, to what was then the Belgian Congo. The press was charmed by the notion of this "one-woman" expedition (which was to say that she was the only white person on the expedition; Delia always traveled with a team of porters) in part because of the apparent contrast between this seemingly dignified, handsome woman and her adventures in the jungle. But she also railed against European encroachment upon Eastern and Central Africa, especially where the brutal treatment of the indigenous peoples were concerned. She was furious when a military officer told her that he never left his post in Eastern Kenya without a company of armed guards, noting that it was no wonder these men encountered hostility from the locals. Her own approach was one based on friendliness and courtesy, and she often credited her gender with her ability to move safely through the villages she visited. She was often treated as a curiosity by the people she encountered. Some had never a white woman before; some had never seen a white woman in pants, and hardly anyone had ever seen a person with such shockingly silver, long hair. Delia's trek was funded in part by the Brooklyn Museum, and she did collect some specimens during this particular expedition, including the first examples of Heterocephalus phillipsii, a small rodent, to reach the US. But she also spent a great deal of time observing the people of pygmy tribes she encountered. When she entered a new village, Delia would bring gifts of food, salt, tobacco, and various trinkets, and for her courtesy she was often allowed to observe, sketch, measure, and photograph the villagers. She refuted a popular notion that pygmies were short in stature because of poor heath and malnutrition, finding people who had more than enough to eat and were largely free from disease. And she made an effort not to pass judgment on certain cultural differences; upon discovering that two boys who had been sent to accompany her on a hunt were cannibals, she was personally revolted, but offered no moral condemnation of the practice in her interviews and writings. After her "solo" expedition, Delia began to publish, and eventually she decided to launch yet another expedition to further study pygmy peoples. By then, she had captured the imagination of scores of women, many of whom wrote her letters begging to accompany her on her journey. After she undertook the five-month expedition, the New York Times published a full page of her pygmy photographs. That expedition proved her last. She married a fellow retired adventurer, Dr. Warren Howe, and lived out a quieter life, dying in 1970 at the ripe age of 95. While Mickie's career as an explorer is often overshadowed by her first husband's and the immense physical legacy he left behind, Delia Akeley was a significant American explorer in her own right, one who inspired many women to dream that they, too, might travel safely through Africa with a spirit of friendship and an intellectual curiosity.